Sahasra nAma AvaLi means "A series of Shasra nAmas of our Hindu Deities. Some of them are given with the meaning of each of the 1000 names. Some others are given as nAmAvaLi for doing sahasra nAma archanai. The aim of this thread is to give the correct pronunciation of the names - with meaning wherever possible. The VishNu SahasranAma is a list of 1, 000 names of Lord VishNu – one of the three main Gods in Hinduism viz Brahma, VishNu and Siva. 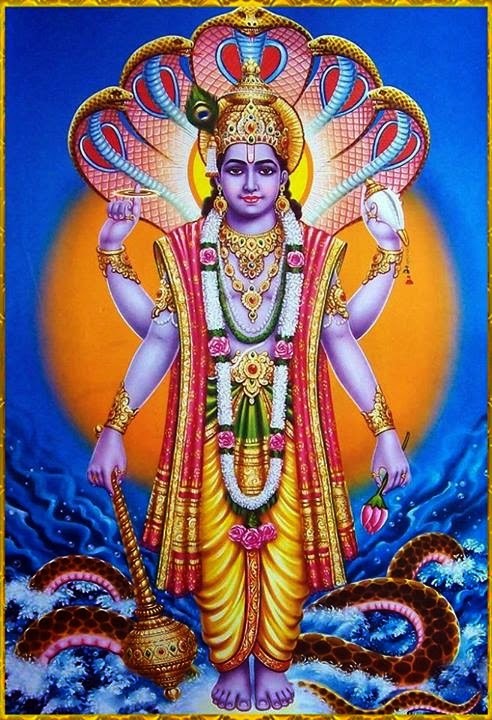 The main God worshiped by the VaishNavas is VishNu. These 1000 names are found in the MahA BhAratam as a dialogue between Bheeshma and Yudhistra. At the end of the Mahabharata war, BhishmAchArya was awaiting on his bed of arrows for the auspicious and sacred hour to depart from his physical body unto the lotus feet of the Lord NArAyaNa. Yudhishtira (the eldest of the Pancha PANdavas) was desperately looking for the answers to serious matters related to The Dharma and The Karma. Lord Sri Krishna understood Yudhistira’s uneasy mind riddled with unanswered questions and guided him to Bhishma to learn and get an insight in to this precious knowledge. Bhishma was acknowledged to be one of the twelve most knowledgeable people of all the time. The other eleven were Brahma, NArada, Siva, SubramaNya, Kapila, Manu , Prahlada, Janaka, Bali, Suka and Yama. The VishNu SahasranAmA has been the subject of numerous different commentaries. The commentary written by Adhi Sankara in the 8th century is particularly influential for many schools of Hinduism even today. This is an attempt to give the 1000 names correctly both in Sanskrit and English, with the meaning of each of these 1000 names in English. He who knows the body and its experiences. Lord Siva also has two different versions of Sahasra nAma. One of the two is based on the names taken out of Rudram. More so since I can compile 15 different Sahasra nAmas here! He who is mightiest of the mighty and He who is fierce. He who gives joy to good people and sorrows to the wicked people. He who incarnates because of the world. He who is the cause of this world. He who cannot be obstructed, stopped or resisted by anyone. He whose navel is like a beautiful lotus flower. He who is the Law and the giver of the Law. He who cannot be vanquished or conquered. He who is well celebrated, the most famous of all. He who has innumerable feet. He who can not be comprehended through any of the known pramANas. He from whose belly all forms of life shower forth. He who stands apart and separates Himself from everything else. He who is The ParamAtman from whom AmrutAmshu or The Moon originated at the time of the churning of the Milk-ocean. He who sustains all the living creatures as the vital air.